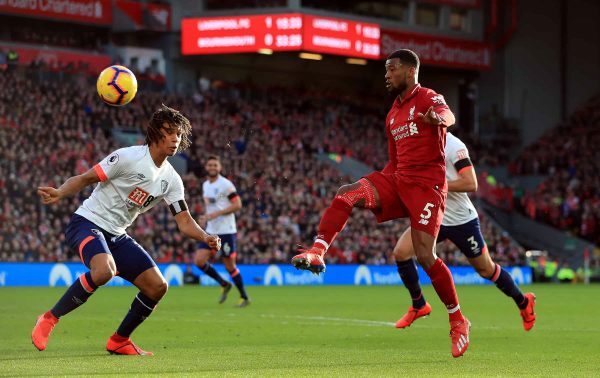 Gini Wijnaldum produced a sensational performance as Liverpool won 3-0 over Bournemouth on Saturday, despite suffering with illness in the buildup. The Dutchman returned to the starting lineup as Jurgen Klopp‘s sole change from the side that drew 1-1 at West Ham, taking over from Adam Lallana in midfield. He joined Fabinho and Naby Keita in a three-man unit, and was the most advanced of the trio, penetrating the Cherries’ back line with overlapping runs—often as the furthest man forward. One of those saw him latch onto a brilliant pass from Andy Robertson and lob Artur Boruc for Liverpool’s second, on their way to a comfortable win and a return to the top of the Premier League. Besides his goal, it was a man-of-the-match showing from the No. 5, who created the second-most chances of any player (three) and kept things tidy in the middle by completing 90.9 percent of his attempted passes. A bout of illness has seen Fabinho, Virgil van Dijk and James Milner all struggle of late, but Wijnaldum was able to battle through his ailments on Saturday. Speaking in his post-match press conference after the game, Klopp revealed that the magnitude of the 28-year-old’s performance given his illness. 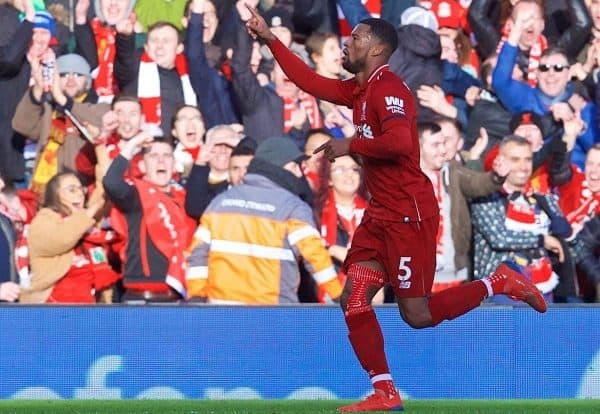 “Last night Gini was not in the team hotel because he had everything that you don’t want to have the night before a game,” he told reporters. “After a few hours’ sleep he said he was ready to play today. And Milner, who was treated similarly ahead of a difficult night at the London Stadium on Monday, continued this in his praise for Wijnaldum, as relayed by Goal’s Neil Jones. “Some of the play was mesmerising. We could have scored more. The crowd was immense,” Saturday’s captain enthused. It is a testament to the midfielder’s quality and commitment that he was able to perform to such a high standard—arguably one of his best this season—having spent the past two nights ill. He had also missed two of the past three games with a knee problem, and Klopp was clearly keen to ensure no issues flared up as he replaced him with another player returning from injury, Trent Alexander-Arnold, on 77 minutes. Fortunately, Liverpool now have a nine-day break before the Champions League last 16 first-leg clash with Bayern Munich at Anfield. 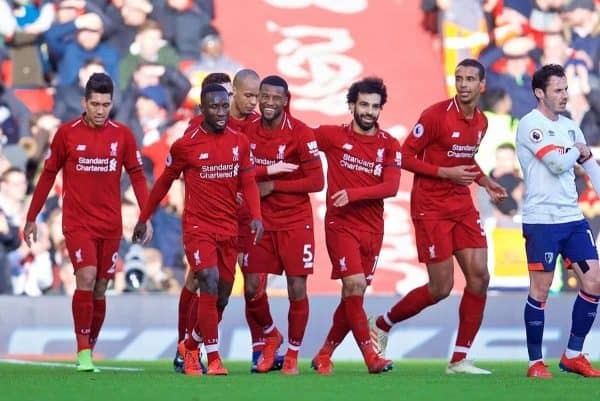 They will head to La Manga for another warm-weather training camp, and the hope is a spell without games can allow the likes of Van Dijk, Milner, Alexander-Arnold, Wijnaldum and Jordan Henderson to fully recover.